The Matthew 25 Challenge is a week-long challenge that will help you and your family step out of your comfort zones and engage in God’s love for “the least of these brothers and sisters” who Jesus calls us to care for in Matthew 25:35-40. Sign up today, and you’ll get one email a day over the next week with your daily challenge, impactful stories, and ways to pray and talk about Matthew 25 with your family. Receive daily text updates with each day’s challenge details. Share this video on social media to invite your friends and family into the challenge! Click the image above to download a family activity guide which will guide you through the challenge each day complete with ways to engage the whole family in this transformative experience. 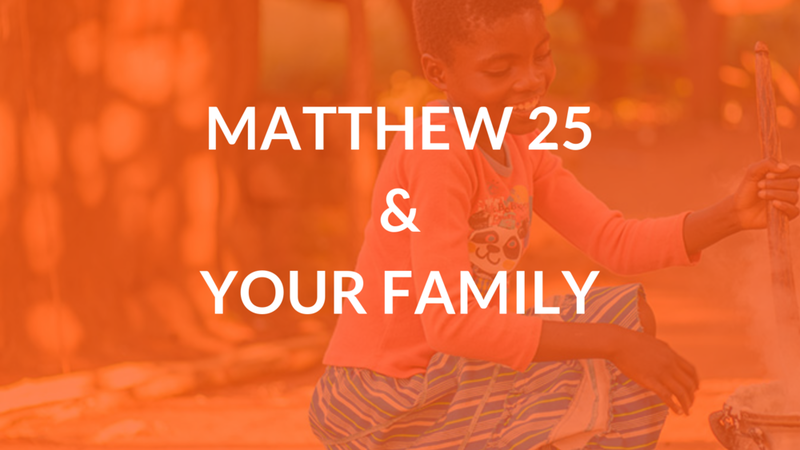 Click below to learn more about World Vision and the Matthew 25 Challenge.